Mr PeeEwww was a nice man who lived in a nice house with his Vulturegull, Columbo. Mr PeeEwww liked good food and fine wines, watching TV and writing open letters to celebrities. But, what he liked most of all was tidiness. He spent most of his time making sure everything was clean and neat and in its place. If there was even one unwashed cup in the house, he couldn’t relax until it was washed and dried and put away on the right shelf in the right cupboard and the sink was rinsed and the towel was folded and hung on the towel rack. One Saturday afternoon, Mr PeeEwww was watching his favourite programme, ‘Incredible Adventures in Sock Puppetry’, when what should poke its head through his window but an Ostriclops. Now, Ostriclops are very rare and valuable mythical creatures. They are valuable because they are rare and rare because they are valuable. Never one to overthink things, Mr PeeEwww made a dive for the Ostriclops, who just said ‘Bobbysocks!’ and hopped out of the way. Whoosh! Right through the window flew old Mr PeeEwww and he crashed into the pond with a big plop. ‘Bobbysocks!’ said the Ostriclops hopping in through the window, and closing it behind him. ‘Grrrr! Hmmm! Snarrf!’ thought Mr PeeEwww, now both untidy and wet, ‘Catching this Ostriclops mightn’t be as easy as I thought. I know! I’ll borrow a big net from Fishy McGristle at No 17.’ And off he went down the street, all drippy and squelchy. Fishy McGristle was not very happy to see Mr PeeEwww squelching on his doorway. Fishy didn’t really like dripping neighbours. He liked fishing and being left alone to eat fish and watch TV in his underpants and tweet angrily about what the presenters were wearing. ‘Sorry to bother you, but I was wondering if I could borrow a fishing net?’ said Mr PeeEwww. Mr PeeEwww hadn’t meant to tell Fishy why he needed the net but he was so discombobulated from his fall into the pond that he forgot to think of an excuse. ‘Well, it’s like this, Fishy, my old neighbour. I’ve been kicked out of my house by an Ostriclops and I need a net to capture it. I mean you should see this thing- all claws and stripes and cunning eye gleams. Meanwhile, the Ostriclops was exploring Mr PeeEwww’s house (Ostriclops are very curious creatures, in both senses of the word). First he went up the stairs and had a look around the bedroom, trying the bed out for comfort and springiness. It was very springy, so he spent about five minutes having a nice bounce and left big footprints in the duvet. Then he examined the bathroom, which was very white and bright. Ostriclops don’t have teeth, but they love minty things, so he gargled all the mouthwash and chomped the toothpaste tube until it split in half, spraying toothpaste all over the room and frightening him so much (even more than Halloween) that he tripped on the bathroom mat and landed in the bath. Ostriclops enjoy baths very much, but they don’t particularly enjoy being flung into hard, waterless, human baths any more than the next creature. Unless the next creature is very, very odd (and probably best avoided at social events). Slightly shaken, but not overly stirred, the Ostriclops clopped down the stairs and found himself face to face with Columbo, the Vulturegull, who was, as usual, trying to peck open the fridge while listening to ‘Celebrate’ by Kool & The Gang. ‘Jodhpurs?’ said Columbo, frowning a feathery frown. 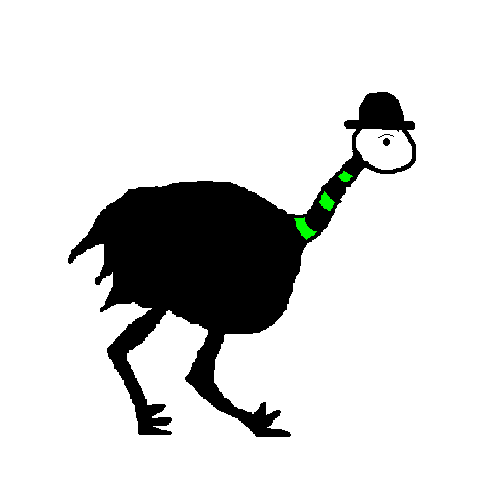 ‘Bobbysocks!’ said the Ostriclops, shaking his head. With that, the Ostriclops and Columbo set to work together. With the aid of a piece of string and some nifty beak work, they soon had the fridge open and were sitting on the kitchen floor devouring all of Mr PeeEwww’s delicious delicacies. Fishy McGristle spat a mouthful of fishy smelling tea right into Mr PeeEwww’s face. ‘Reward? Yes, rewards are good. I like rewards. Even shared rewards are pretty good, I suppose. Ok then, let’s go on an Ostriclops hunt. Wait here, PeeEwww, we’ll need some equipment for a job like this. Hmmm, I wonder if I should bring my fishing dynamite…’ Off he went, leaving Mr PeeEwww dripping mournfully and smelling a good deal fishier than, in his opinion, any person should. Creeping. Crawling. Slithering. Slightly Stumbling. The hunters worm along the edge of Mr PeeEwww’s garden hedge. Inside the house, Columbo and the Ostriclops were full and drowsy and watching a ‘Come Dine With Me’ marathon surrounded by chicken bones and dirty plates and pizza crusts and empty wine bottles. The floor was practically invisible beneath all the rubbish. ‘Bobbysocks.’ Said the Ostriclops as a particularly mean contestant gave the last host a terrible mark for her meal. ‘CRASH!’ went the door and in tumbled Fishy McGristle and Mr PeeEwww and a big fishing net. Fishy threw the net at the Ostriclops, who tried to dodge it, but he was too full, far too full of delicious food and wine to move out of the way in time. ‘We got him!’ shouted Fishy McGristle. ‘Indeed we did! shouted Mr PeeEwww. ‘Caaaawwwww!’ shouted Columbo, flying, claws out, straight into Fishy’s fishy face. ‘Ahhhh!’ said Fishy, as the Vulturegull clamped onto his head, flapping furiously. Mr PeeEwww just didn’t know what to do. On the one hand, he wanted to catch the Ostriclops and on the other he quite enjoyed the sight of Columbo giving Fishy McGristle a free haircut (he hadn’t forgotten the tea spitting incident). Suddenly there was a loud POP and the Vulturegull dropped to the ground, unconscious. The last thing Mr PeeEwww saw before he felt a sharp pain was Fishy McGristle pointing a gun at him. Then everything went black, then grey, then a sort of aquamarine and then back to black. ‘Meeehweeeglubbits. Stop eating all the cake. Leave some for me. No, I don’t want fish stew. I HATE fish stew!’ A creature with the body of a person and the head of a fish was gobbling up all his madeira cake and, with the other hand, throwing big globs of fishy gunk at his head. It wasn’t good. It wasn’t good at all. It was goo. And then, just like magic (it never hurts to have magic in a story, its really rather handy), the dream sequence faded and Mr PeeEwww woke up and pulled the tranquiliser dart out of his leg. Mr PeeEwww had a sizeable headache. Then he had a large glass of water. 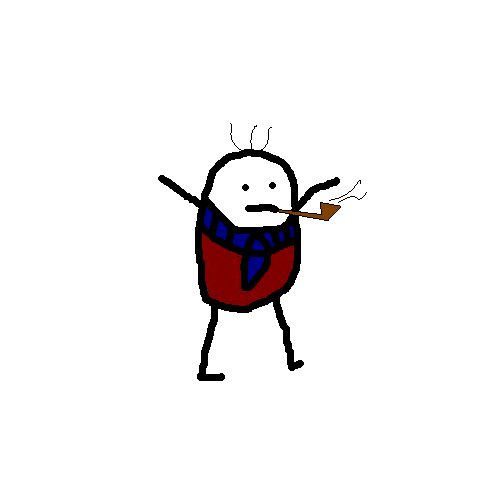 Then he had a very large glass of wine, after which he felt, not quite fine, but less unfine. Then he saw to his Vulturegull, who had woken up but was stumbling around the room in circles reciting the lyrics to ‘Celebrate’ over and over in his own language. So they set to tidying and brushing and mopping although, truth be told, Columbo was much better at making a mess than cleaning one up. By the time they were finished it was well past bedtime and the two companions were worn out, what with the day’s excitement, the tranquiliser darts and the housekeeping. So they sat down for a wee breather and before they knew it they were sound asleep. The sun was high in the sky when Mr PeeEwww woke up. ‘Himmity Jimmity!’ he said, rubbing his eyes. Columbo was still sound asleep and snoring loudly. ‘Wake up, you silly sausage!’ said Mr PeeEwww, poking the Vulturegull in the ribs. ‘Sausage! 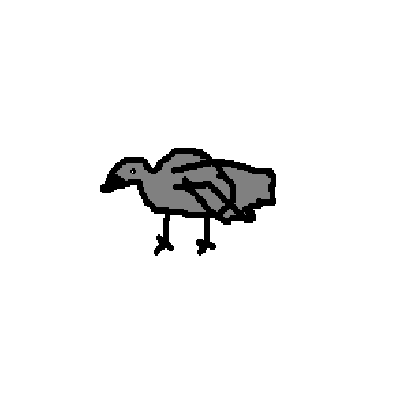 Sausage!’ said the Vulturegull, jumping up and down and flapping his wings with excitement. He loved sausages (unfortunately, sausages didn’t always love him!). So, it was with stomachs full of sausage, egg and determination that Mr PeeEwww and Columbo marched up to Fishy McGristle’s house and knocked on the door. There was no answer. So they knocked again and again, louder each time. There was still no answer. They went all around the house (twice, once in each direction). Mr PeeEwww checked the ground floor windows while the Vulturegull looked upstairs, but there was nobody there. So they broke into Fishy’s house (Vulturegulls are usually very good at opening locks because they’re so greedy and locked doors often have food behind them). They looked in the kitchen (full of fish), the sitting room (full of old newspapers and old fish), the bathroom (full of *** and old fish), the bedroom (full of trampolines and old fish) and the closet (full of nets and wellies and dynamite and old fish) but nowhere in the house did they find a room full of Ostriclopses. Or even one single Ostriclops. ‘Fishy! Fishy! Fishy!’ said Columbo. ‘Too old for this! Go! Now!’ said Columbo. As luck would have it, there was a taxi passing by. This saved them from having to walk all the way to the river, which, in any case, wasn’t a great distance away. The river was dark and wet and drowny and deserted. Deserted, that is, except for one gristly looking fishing boat bobbing about at the end of a rickety pier. Columbo and Mr PeeEwww crept towards the boat and looked in through an open skylight. There was no sign of the Ostriclops, but Fishy McGristle was there, sitting back in an old wooden chair with his smelly fishy boots on the table. He seemed to be arguing with a man. A very familiar looking man. ‘Himmity Jimmity!’ whispered Mr PeeEwww, ‘I know that man. It’s Tawdry MacGuffin, the presenter of Incredible Adventures in Sock Puppetry. But what’s he doing with Fishy and d’you think I can get an autograph? Luckily, Fishy was a shouter and Tawdry MacGuffin, being a TV presenter, was only happy when the whole world could hear him. When they got to the bottom of the ladder, they weren’t quite sure what to do next. ‘Shuush!’ said Columbo, cocking his head to one side. They listened. Slowly, the sound became clearer. It was the unmistakable sound of an Ostriclops in distress and it was coming from a big wooden box in the middle of the hold. Columbo set to work on the lock (a rusty old padlock that smelt of fish and was no match for a motivated Vulturegull) and soon they were able to let the Ostriclops out of the box which is not as similar to letting the cat out of the bag as you might think- cats are much more likely to squirm and scratch. ‘BOBBYSOCKS!’ said the delighted Ostriclops, hopping about on one leg before slipping on a fish and banging his head on a bit of the ship that none of them knew the name of. ‘Well we didn’t, not that it’s any of your business, but we came to an agreement in just 24 more.’ said Fishy. ‘Let’s just shoot them. Then I can take my Ostriclops and go. I’ve got to record another show later and if I’m not on time the sock puppets get grumpy. It’s tough enough getting them to learn their lines at the best of times.’ Said Tawdry McGuffin, proving that he was quite, quite mad. ‘NO! NO! NO! NO!’ screamed Tawdry McGuffin, jumping up and down and shaking his fists at everyone and generally causing a bit of a distraction. ‘HA! While you were all busy being distracted, I gained the upper hand.’ said Mr PeeEwww, pointing the rectangular object at Fishy McGristle, who was trying, with little success, to calm McGuffin down by slapping him with a fish. ‘What are you going to do with that thing?’ laughed Fishy. He pushed a button. Nothing happened. Then another, still nothing happened. Then he checked the batteries and gave the device a wipe with his handkerchief. Once again, nothing happened. Fishy screamed in pain and accidentally shot Tawdry McGuffin with a tranquiliser dart. Mr PeeEwww, Columbo and the Ostriclops scampered up the ladder and locked the hatch behind them. Once they were safely on dry land, they cut the mooring lines from the boat and jumped up and down in victory as it floated aimlessly downriver. Then they went home, tidied themselves up and had delicious food and fine wines to celebrate. ‘Naaaw!’ said Columbo. He’d gotten used to the Ostriclops. ‘Bobbysocks!’ said the Ostriclops, burying its head under a rug. So the next day Mr PeeEwww placed his ad in the paper. Nobody answered it for a long, long time and the Ostriclops stayed put for a long, long time. It even tidied up after itself now and again.